Surrey Fitness Camps Members Awards! 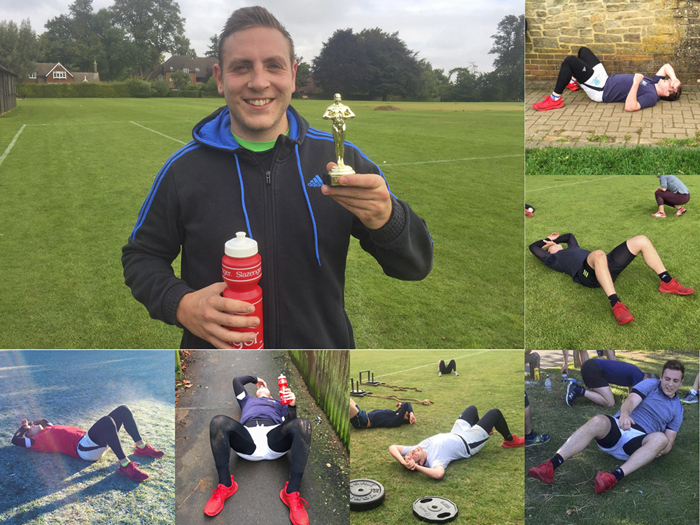 Every month we present two member award – the first to the member who is top of our ‘Attendance Leaderboard’ to the member who makes it to the most classes and Personal Training sessions each month! The second is our big ‘Member of the Month’ award. This award generally goes to a member who has made a phenomenal effort, maybe has seen great results, big improvement in their fitness level or perhaps completed a fitness challenge. We also have our annual ‘Member of the Year’ award and our other annual ‘Special Achievement Award’. With over 400 members throughout Godalming, Cranleigh, Guildford, Liphook, Hindhead and Haslemere it’s not the easiest decision to pick one winner! Check back here regularly to see who the latest winner is and what they have achieved from coming to our classes to get the award! Eddie started hitting in hard in January with his usual ‘I’ve eaten and drunk too much at Christmas’ gusto! We’re not saying Eddie has a reputation of doing this (ha!) but we kinda expected him to fall off the exercise wagon BUT he is still hitting it hard, getting fitter and stronger every week. He is on a mission and absolutely smashing the sessions and has now added in a weekly small group Personal Training session into his weekly routine. In the last three months Eddie has done 35 classes and four small group Personal Training sessions! Everyone has noticed how his fitness has literally gone through the roof, he has lost weight and is getting in fab shape. Ed has been a super loyal member and someone who always champions what we do. 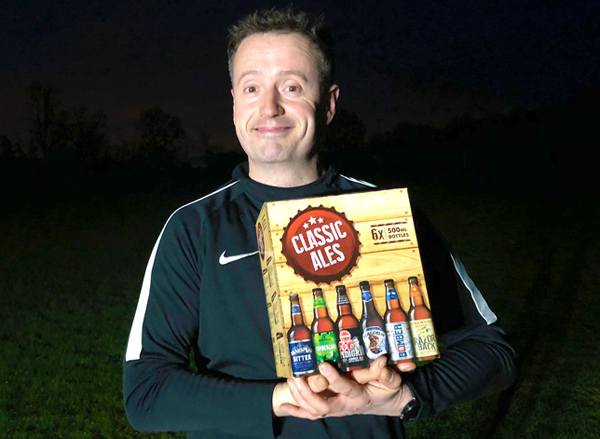 He epitomises everything about Surrey Fitness Camps with a huge friendly personality who gets on with everyone and makes new members feel welcome. Well done Eddie, fully deserved!!! Another winner from the Haslemere crew!!! 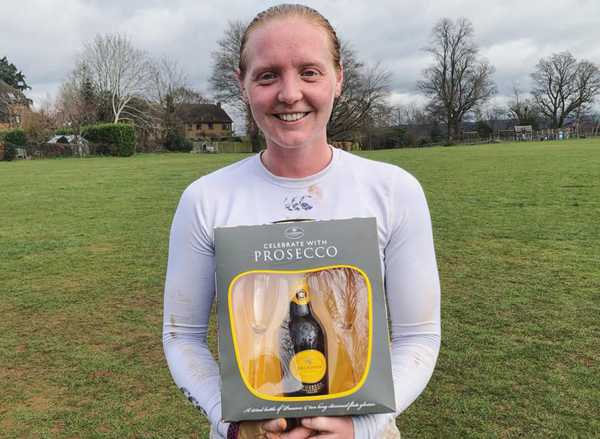 Kelly tops Surrey Fitness Camps March ‘Attendance Leaderboard’! Her March workouts included 21 classes and 7 small group Personal Training sessions! New entries in the top ten this month include Sabrina, Annabelle, Sam and Anne who have all had a fab month hitting it hard and getting to lots of classes! All March scores will be added to produce a yearly winner plus an overall top 10 for 2019! We’ve started from fresh again in April so let’s see who’s going to win it this month! 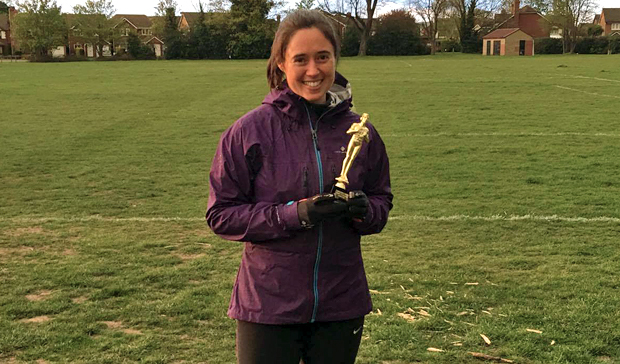 In February Hayley has completed the Hampton Court Half Marathon and the ‘Jaw Dropper’ full marathon as well as making it to 11 classes and taking part in two small group Personal Training sessions! That’s one hell of an effort! Hayley is also an unofficial SFC employee being our chief demonstrator at every class she comes to! Ha! 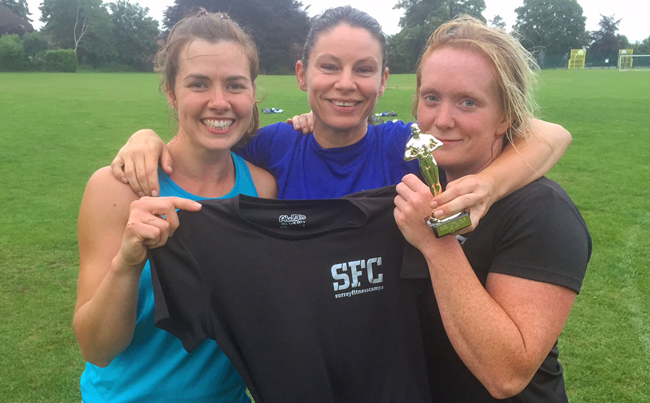 Hayley’s been a hugely positive part of SFC since she joined three years ago making it to three classes a week almost every week and smashes every class! Amanda has had a terrific January and February. She has made it to four classes a week most weeks travelling up from Grayshott to our Monday and Saturday classes in Godalming as well as being an ever-present at our Tuesday and Thursday classes in Haslemere! Between January and February Amanda as made it to an impressive 28 classes. We’ve seen a huge improvement in her fitness over the last two months and despite drinking Estonia dry last weekend was back on it hard again this week! She’s a great egg, super nice person who is incredible popular with all our members. Well done guys, fully deserved!!! Big up the Haslemere crew!!! Naomi tops Surrey Fitness Camps February ‘Attendance Leaderboard’! We thought January was a busy month but boy you guys smashed February big time! Her February workouts included 18 classes and 6 small group Personal Training sessions! New entries in the top ten this month include Eddie, Susanne and Paulina who have all had a fab month hitting it hard and getting to lots of classes! All February scores will be added to produce a quarterly and yearly winner plus an overall top 10 for 2019! Godalming Boot Camp member Tara Phillips latest ‘Member of the Month’! Tara had a sad time at the end of 2018 with the passing of her Dad but was determined to start afresh in January, refocus on making her own health and fitness a priority. She’s had an incredible January – 17 classes and one small group Personal Training session! She has been rewarded with a big change in her body shape, weight loss and huge improvement in her overall fitness which is why she is fully deserving of this recognition. Tara is one of our long standing (suffering!) members, hugely popular with everyone and an absolute legend on a night out so I know everyone will be chuffed that she’s won this award. There were other members who have had a fab January that we want to give a shout out to; Adrianne Brown for *almost* doing ‘dry January’, Ali Watts, Amanda Henderson, Susanne Hales and Clare Cowing for having a great month hitting lots of classes and a noticeable improvement in their fitness! Well done Tara, keep in going!!! Godalming member Annabelle Flint tops the January Leaderboard! Our new Surrey Fitness Camps initiative for 2019 is an ‘Attendance Leaderboard’ with a monthly, quarterly and yearly leaderboard produced with a prize for winners! January has been a crazy month, lots of you getting on it after an epic Christmas eh! We’ve super busy classes and LOADS of members smashing it hard getting their butts along to classes! Annabelle came to an amazing 23 sessions in January that included 13 classes and 10 small group Personal Training sessions! That’s a whopping 23 sessions in 30 days! What a star!!! All January scores will be added to produce a quarterly and yearly winner plus over all top 10! Godalming Boot Camp member Tamsin Pulfrey latest ‘Member of the Month’! After another busy (yet a tad cold!) 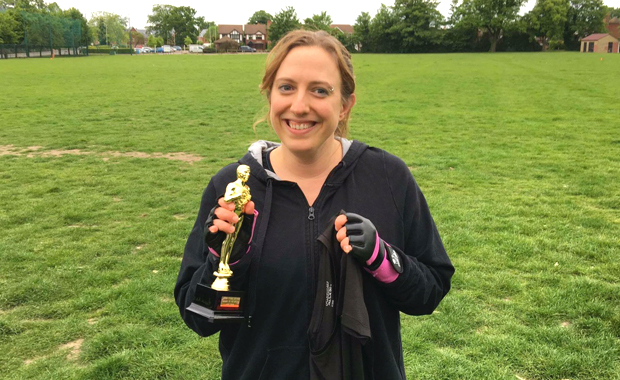 Monday evening fitness Boot Camp in Godalming we awarded Tamsin Pulfrey as our latest ‘Member of the Month’! Tamsin is one of our longest serving members for getting on for six years, (if not longer?!) and we’re not sure how Tamsin hasn’t won this award in the past, somehow slipping through the net! Tamsin has been a hugely loyal and incredibly supportive member of everything we do at Surrey Fitness Centres that we hugely appreciated. Her ongoing support of our classes in over the years in Cranleigh and Godalming, bringing new people to classes over the years, going out of her way to drive members to/from classes and fitness events – all hasn’t gone unnoticed. In her many years as a member she has completed a countless number of fitness events and races including Brutal Runs, the Nuts Challenge, various 10km races, all topped by completing the Brighton half and full marathon earlier this year. Lately Tamsin has really upped her fitness to another level, joining in regular PT Blitz sessions with Mark which has coincide with a real improvement in the her overall fitness and new zest at our classes that we have seen. Well done Tamsin and thanks of the years of loyalty to SFC! Godalming fitness Boot Camp member Adrianne Brown is our September Member of the Month! After a super busy Tuesday morning fitness Boot Camp in Godalming we awarded Adrianne Brown with our latest ‘Member of the Month’! Through her weekly PT Blitz session and new focus her strength has improved so much so that we have members almost every day commenting to us on how much she has improved. Her running and overall fitness was always good but in the last 3-4 months she’s gone to another level which has been amazing to see. She’s also a really nice person, someone who is a joy to have a classes with a positive attitude and friendly personality that rubs off on other members. Adrianne has been a huge supporter of Surrey Fitness Centres, recommending us to friends and dragging them along to classes that we really appreciate. Well done Adrianne, really well deserved! This morning we presented Godalming member James Pringle with our latest ‘Member of the Month’ award! With James moving to London and this his last class (though is has promised to come back lots for a beasting) it’s only fitting that we give him this award today. James has built up a bit of a reputation through the years….you will see a trend with in the photos! He comes to every session and literally goes hell for leather, drops, gets up, goes hell for leather again, drops again! Best of all, there’s more times then not when James rocks up having had a skin full the night before (like this morning!) which makes it even more impressive! Then there’s the injuries, trips, falls and running into a wall at full speed! As we said, he has a reputation! On a serious note, James is incredibly popular with everyone at Surrey Fitness Centres. A really top guy who we will miss a lot but hope he keeps to his word and comes back to see us lots when he’s back in the Godalming ‘hood. 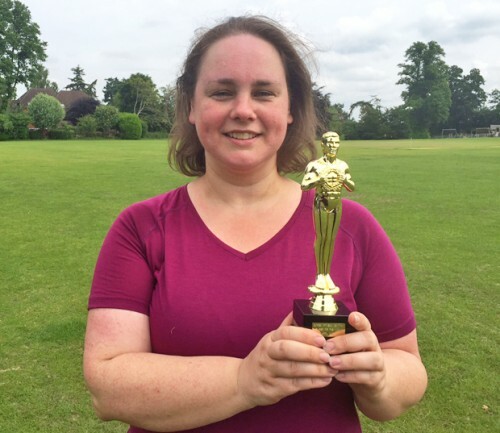 Godalming fitness Boot Camp member Kelly Williams is our June Member of the Month! 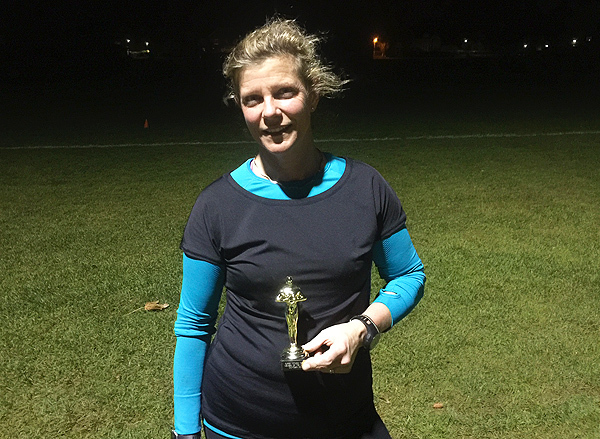 After a busy yet damp Monday evening fitness Boot Camp in Godalming we presented Kelly Williams as our latest ‘Member of the Month’! A regular at a least three of our classes a week over the last two years she also takes part in 1-2 small group Personal Training sessions with Mark, Kelly is a fantastic example to members with her consistent attendance and is reaping the rewards with a notable improvement in her fitness and change in her body shape. Not only that, Kelly is one of the hardest working members we’ve ever had, literally she gives it 100% pushing her to the max at every class as has been the case since day one. This effort and determination is infectious and she pushes other members to work harder and push themselves! Kelly has been a hugely loyal and incredibly supportive member of everything we do at Surrey Fitness Centres that we really appreciate. 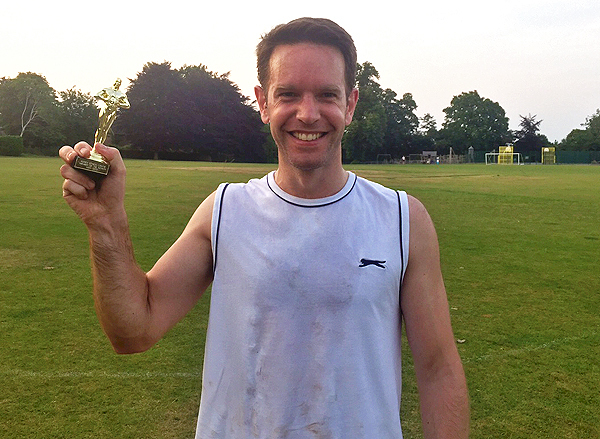 Our latest ‘Member of the Month’ was presented this evening at a sweltering Godalming Boot Camp to Laurence Pearce! Laurence is a relatively new member having been with us for just under a year, but in that short time has made a real positive impact at the sessions. He is someone who has really embraced what we at Surrey Fitness Centres thrive to achieve at every location – a relaxed, fun and friendly vibe at every class. In fact, it could be said that Laurence is nearly as funny as Mark and can give him a run for him money at times with his wit! We pride ourselves of have a fab bunch of members where everyone gets along and forge friendships and Laurence has really added to this, is someone that all members really enjoy having at the classes. As well as been a top guy Laurence is a machine at classes pushing himself and other members to the max…..and how could we forget to mentioned the amazing sportswear (the tank tops!) that he wears! Well done Laurence, very well deserved! Godalming fitness Boot Camp member Carole McCreadie wins April Member of the Month! Today we presented Godalming member Carole with our latest monthly award. Carole has absolutely smashed it in 2017 – coming 2-3 classes a week consistently and has reap the awards. Her fitness has literally gone through the roof with every member noticing and commenting on the huge jump in her fitness levels that has come from the extra classes every week plus Carole’s determination to get everything out of each class by giving it 100%. 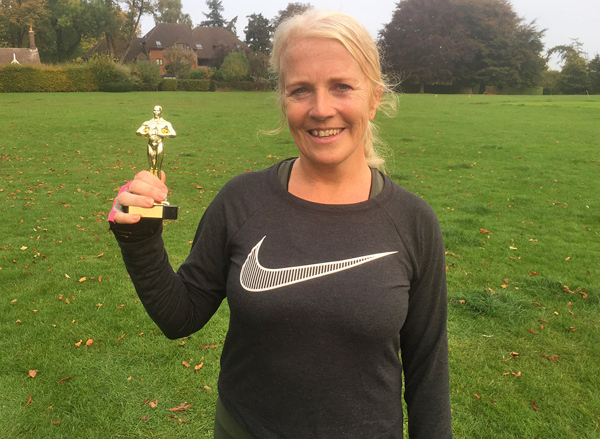 We often comment how each winner of these award are really popular with fellow member but that has never been more the case with Carole and the round of applause she got from her fellow Godalming Boot Camp members on being presented with the award. Carole is a terrific member (four years and counting! ), a big personality who embraces the relaxed, fun atmosphere at classes….regularly giving it back to Mark just as large! Being a QPR fan and fellow West Londoner like the Bossman obviously paid a big part in getting the award! Haslemere & Hindhead member Treena Haigh wins February ‘Member of the Month’! Tonight we presented long standing (suffering!) Haslemere Boot Camp member Treena Haigh with the February ‘Member of the Month’! 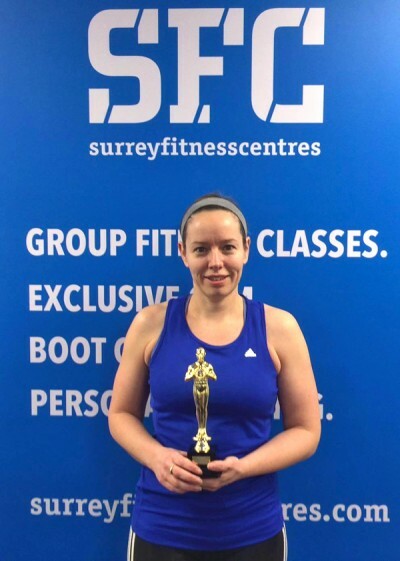 We’re not sure how or why we haven’t given this award to Treena in the past as she really is one of the most loyal, dedicated and friendliest member we have ever had at Surrey Fitness Centres in the past 6-7 years – a member of Surrey Fitness Centres four years this May! Treena has been a member for over three years and a huge supporter of SFC and everything we do from bringing new members to classes to travelling from Liphook to attend classes in Godalming and Farnham. In February, just like every month, she has attended classes regularly at various locations and even does a fortnightly Personal Training Blitz with us. Everyone that has been in a class with Treena knows that you get nothing but 100% from her and she is someone who adds to the great vibe we have in Haslemere with her infectious personality and humour! Lastly, Treena is also our social diva and has built a fine reputation over the years for her exploits at our members parties! Well done Treena and thanks for your support of SFC! 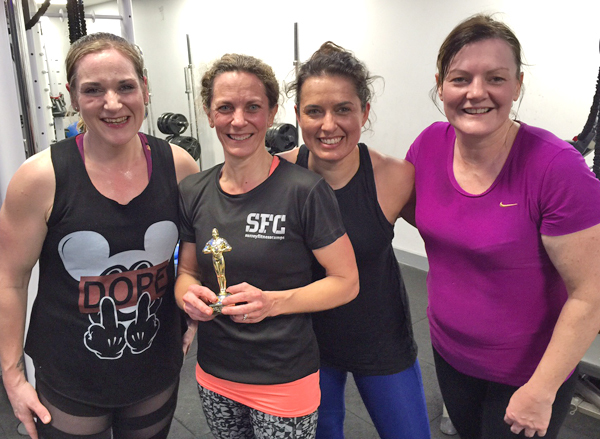 After a gruelling, pre-Easter sweat-fest fitness class in Farnham with Mark we presented our March ‘Member of the Month’ award to Sue Holford! We have all noticed Sue really upping her game on the last few months, pushing herself harder at every class and now regularly taking part in weekly Personal Training Blitz sessions with Grant. Whether it’s a class or PT session that she takes part in Sue will always give it 100% despite commuting to/from London every day and she is a pleasure to train. Here at Surrey Fitness Centres we have over 400 members and pride ourselves in having a really good bunch of members with a positive attitude, welcoming, friendly atmosphere and this is exactly what you get from Sue. It goes without saying she is hugely popular with fellow members plus our team of trainers and we know our members will be chuffed that Sue won this months award! Our latest winner of the Surrey Fitness Centres ‘Member of the Month’ is Farnham member Lucy Hollis! With over 400 members across five locations, picking one winner is always a challenge but for us Lucy has been the real standout in the last month and in fact could have won these award many times in the past! In the last month she’s taken part in countless group Personal Training sessions with Mark and Grant at our Weydon School Gym, pushing herself to the max every time, embracing all the PT Blitz sessions and classes that she has attended. Lucy has a warm and infectious personality, is really popular with our team and fellow members and someone who really encourages her fellow members. Lucy has been a real supporter of Surrey Fitness Centres over the last 18 months, helping us establish our classes and Personal Training in the Farnham area. Our second annual award is given to a member who has completed an amazing feat in 2016, be it a challenge, a race, event or just a personal challenge. This year there really was only one winner – Surrey Fitness Centres Godalming member Lindsey Duberry who swam the channel from Dover to Calais! Throughout the summer Lindsey was in serious training for over 3months that included weekly Boot Camps classes and one to one Personal Training with Mark. Having lived and breathed the epic training that went into getting ready for the challenge we all now at first hand what a great achievement this was. Lindsey took to the water in early August and made it to France in just over 22 hours to complete the channel swim! 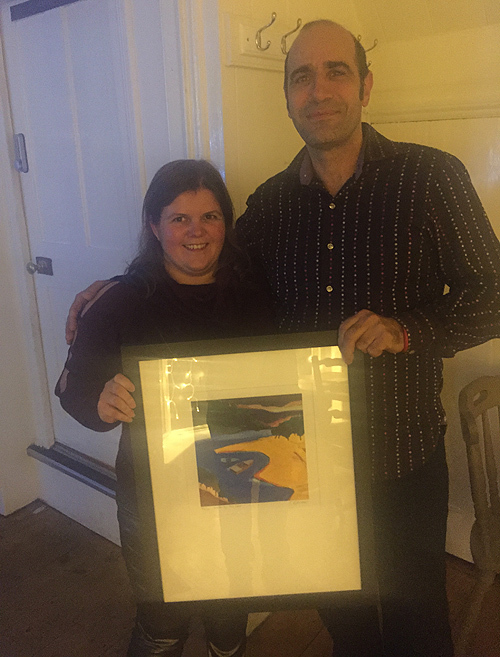 Lindsay was presented her award at our members party which was a limited edition print kindly donated to us by world famous artist (and Surrey Fitness Centres member) Stavros Kotsireas! Huge thank-you to Stavros for this incredible prize! 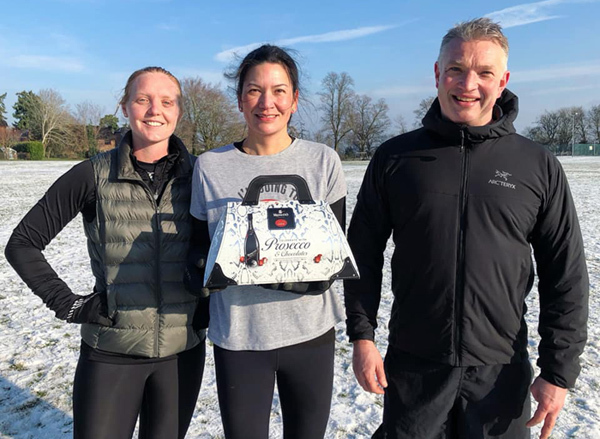 This morning after another killer Godalming fitness Boot Camp class we presented new(ish) member Helen Askew with our second ‘Member of the Month’ award! Helen has only been an Surrey Fitness Centres member for less than three months but we love her positive attitude and WE have been massively impressed with the progress she has made in this short time. Helen is a walking example and testament that our classes are for everyone, whatever your fitness level, whether you are a seasoned exerciser or not done anything for years. Helen came to us pretty much as a complete beginner but does what she can and pushes herself every session to do more. She has stuck at it, regularly attending classes every week, embracing the workouts (even the killer steps!) her determination and positive attitude has seen her drop nearly two dress sizes which is amazing! In her short time as a member Helen has stuck up friendships with other members and great rapport with our team of trainers. Normally it does seem that members have to be with us for years before they get our monthly award but I know that our Godalming members will totally agree with Helen getting this award! We’re really excited to see the results Helen will get over the coming months with us! 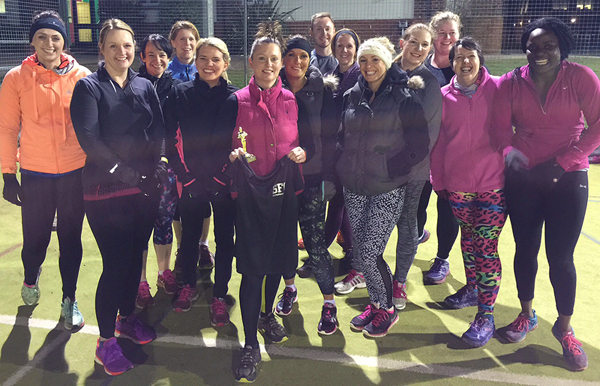 Tonight at our Woking boot Camp in Knaphill we presented Gabbie Johnson with our latest ‘Member of the Month’ award! This was an easy choice and an obvious one for us at Surrey Fitness Centres and all members who know Gabbie! Gabbie has been a member for just over six month, joining our Woking classes in Knaphill in the thick of the winter. It’s say to say that Gabbie wasn’t the fittest member we have had start with us and was someone completely new to the this exercise malarky. She now supports and encourages new members who have started with us lately which is fantastic. Gabbie is a real example to anyone thinking of starting our classes or new members just starting with us that our classes are for everyone, whatever your fitness level you will be made to feel welcome and part of the group and if you stick at it consistently you too will get the phenomenal results that Gabbie has in such a short time! Head over to our Facebook page to give Gabbie a ‘Well done’ on winning the award! 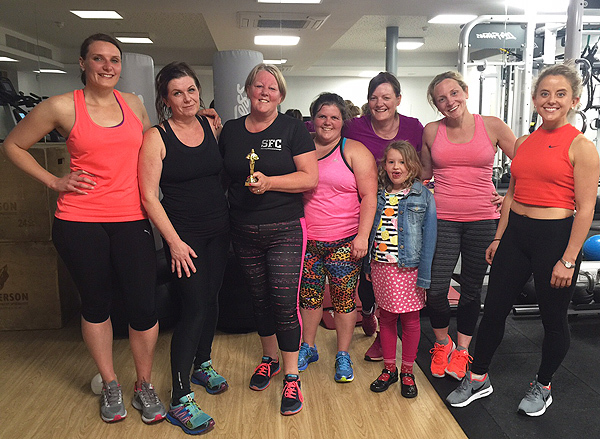 Farnham fitness member Fiona Smithee wins ‘Member of the Month’! 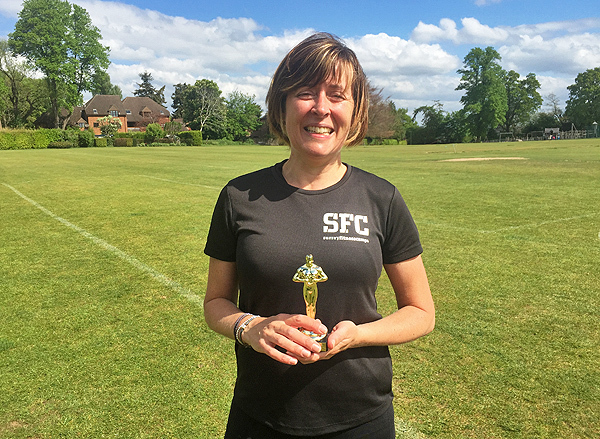 This morning at our Farnham venue at Weydon School in glorious sunshine we presented our Boot Camps regular Fiona Smithee as our second winner of our monthly ‘Member of the Month’ award! With over 500 members and five locations we find it increasingly difficult to chose just one winner of our ‘Member of the Month’ award. For next next few months we will be awarding two members each month for we believe deserve recognition for their fab effort! Soooooo hot on the heals of our Woking member Kate our second winner this month is Farnham member Fiona Smithee! Fiona has been one of the most loyal members since we started Surrey Fitness Centre! Initially living in Camberley she was a regular at classes then, then after moving to Alton kept travelling all the way to our Camberley classes and is now a firm regular at our Farnham venue at Weydon School. Fiona also does a weekly Personal Training session with our trainer Grant (and husband John!) and attends at least two classes a week, every week be it Boot Camps, Old Skool Circuits or ‘Warrior’. Her regular attendance of our fitness classes and adding a weekly Personal Training session has seen her fitness levels and body shape total transformed. We chose Fiona not only for you loyalty to SFC but mainly for her incredible positive attitude and approach to our sessions. Fiona is massively popular with both members and Instructors with her infectious positive attitude at every session. 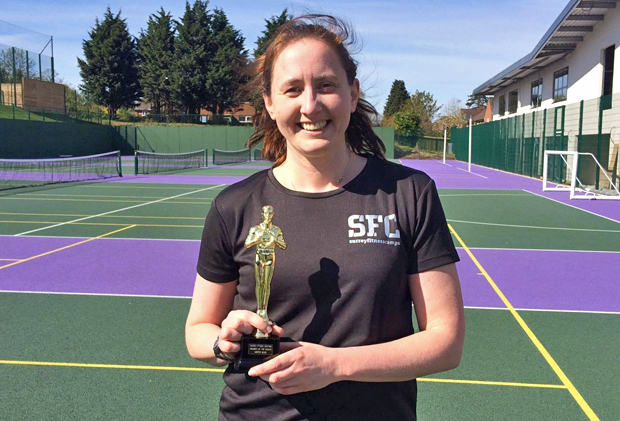 Woking, Knaphill Surrey Fitness Centres member Kate Freshney ‘Member of the Month’! 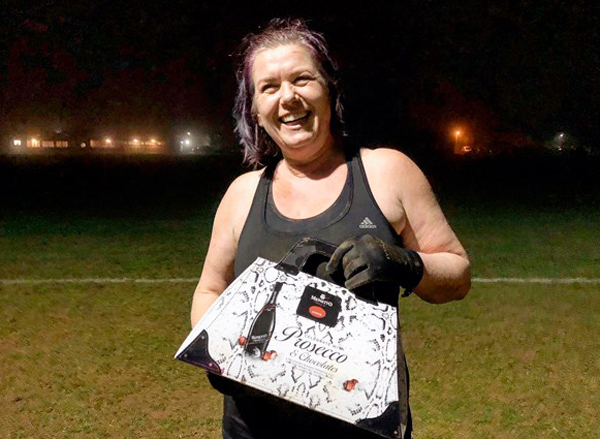 Woking Boot Camp and off-road fitness regular Kate Freshney was tonight presented with the latest ‘Member of the Month’ award! In March Kate managed to get a personal best at the Surrey Half Marathon, completing the race is under two hours. This personal achievement is in part why we chose Kate but also for her incredible loyalty to Surrey Fitness Centres. Kate has been a member for must be 3-4 years and has been a great supporter of our classes in Knaphill. 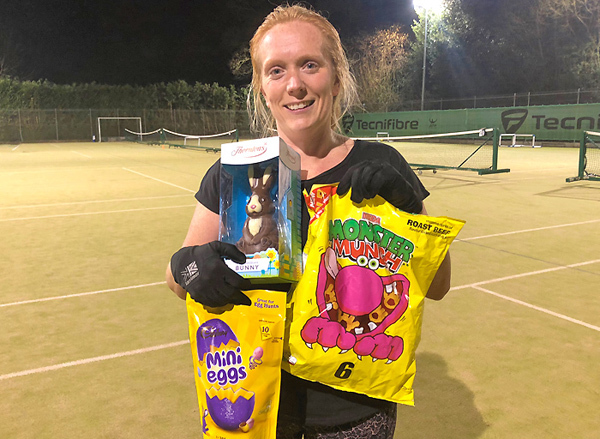 She has attended our Boot Camps in Knaphill and local off-road fitness sessions pretty much every week since joining (bar the odd holiday back to Oz! ), embracing every session with a great attitude, making new members feel welcome and create the great atmosphere we have in Woking now. Her fitness levels have improved off the scale since joining, highlighted by completing the Surrey Half Marathon in a fantastic time. Kate is a really popular member both with members and our team of fitness trainers so we’re really pumped to reward her! Head over to our Facebook page to give Kate a ‘Well done’ on winning the award! 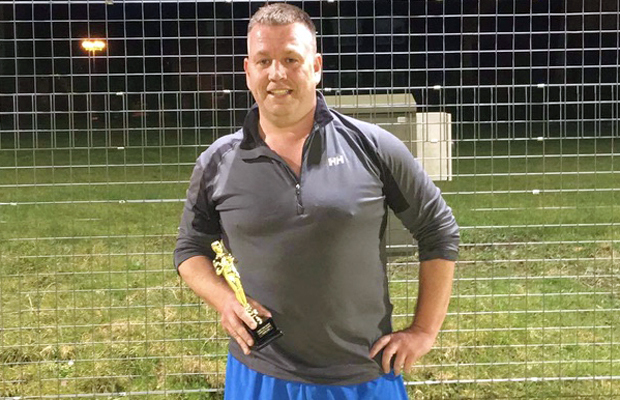 The latest winner of this months ‘Member of the Month’ is Haslemere and Hindhead regular Jason Rasey! Jason is not only a top top guy, someone who gives it everything his got at every sessions (begs for more!) and lost weight and looks fab BUT it’s his dedication to Surrey Fitness Centre that is incredible! Jason travels all the way from Fareham to take part in our classes plus at times he comes straight after a 12-hour night shift in Windsor he shows up to our morning Godalming sessions. There was even a couple of occasions he did two sessions in the one day! Our Haslemere members are a terrific bunch and classes there have a great buzz but this is even more enhanced each time Jason comes. He’s a super friendly, positive person and a huge supporter of SFC. Jason is definitely one of our most popular members with all our team of trainers and all the members that know him. 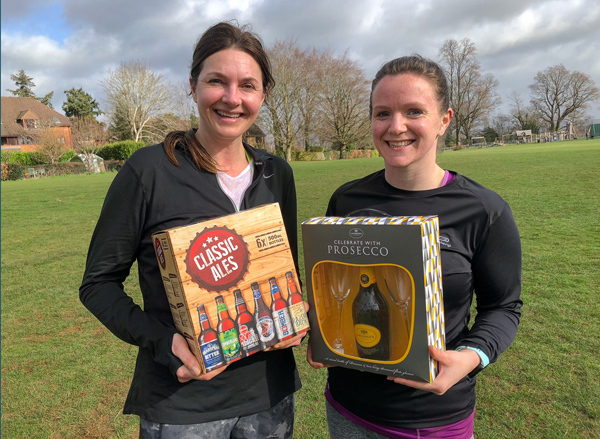 Each month we award 1-2 of our fab members with the award for epic effort, being super positive, coming to tons of sessions or completing some challenges/events! Headover to our Facebook page to give Jase a ‘Well done’ on winning the award! Woking & Farnham regular Viv Palmer wins latest ‘Member of the Month’ award! Last night Surrey Fitness Centres Woking and Farnham super-regular Viv Palmer was award the latest (and long over due) ‘Member of the Month’! We can’t believe we haven’t give Viv this award already and this is a long overdue acknowledgement of her awesomeness! The body transformation over the last 12 months has been phenomenal with members and trainers alike telling her how amazing she looks. We have notice n the last 12-18 months that she has really dedicated and focussed on her fitness. She does a weekly one to one Personal Training session with Grant, does tons of group PT Blitz sessions each month and attends regularly our Boot Camps and Circuit training classes in Woking and Farnham. Viv is a good great example to new and old members in the way she has really embraced Surrey Fitness Centres with a positive attitude, embracing our sessions, coming to lots and making loads of friends along the way. Viv came very close to winning our ‘Member of the Year’ and was on our shortlist such is how highly we think of her. We still recall her first Boot Camp session with Mark flipping humongous tractor tyres and jokingly commenting to her ‘you won’t be back!’. Well 4+ years later Viv is still here, comes to see us 4-5 times a week, is loving SFC and is one of our longest serving (surviving) members! Congrats and a massive well done Viv! Thanks for your support of SFC, we really appreciate it. Head over to our Facebook page to get Viv a ‘Well done’!